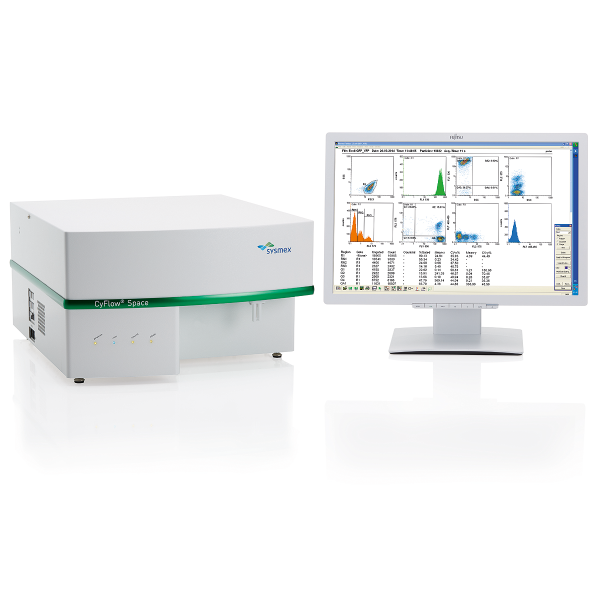 The CyFlow® Space is a bench-top Flow Cytometer designed for cell and particle analysis and absolute counting. It detects two forward scatter signals and one side scatter in combination with up to 13 colors of fluorescence and can be equipped with the CyFlow® Sorter for closed, non-destructive and non-hazardous cell and particle sorting. The CyFlow® Space cell cycle analyzer is suited to a wide variety of applications; up to 5 user defined light sources can be chosen from a wide range of nine excitation wavelengths (355-785 nm). Windows™ based FloMax® software includes multiple online gating, logical gates, and color gating. N-color online and offline software compensation is another standard feature of FloMax® software. Data may be acquired with compensation or as uncompensated raw data. Either way, compensation can be done, undone, or changed after analysis on stored data. User-selectable statistics are calculated on subset populations identified by regions that are created by the user with easy-to-use drawing tools and combined using simple, logical formulas. Other sophisticated features include cell cycle analysis and peak analysis. Custom reports are quickly and easily generated from the acquired data using the integrated, macro-driven interface with Microsoft™ Word and Excel. FloMax® data files are stored in FCS standard, and therefore, they are fully compatible with other commercial flow cytometry software. Sorting input rates can be up to thousands of cells per second with sorting output rate of up to 300 cells per second.